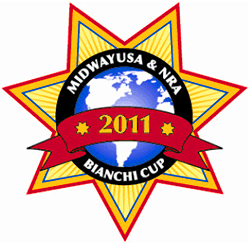 The 2011 MidwayUSA/NRA Bianchi Cup National Championship will take place in Columbia, MO, May 25-28. This major event draws shooters from all over the world. In 2010, international competitors hailed from Australia, Canada, Germany, Italy, Japan, New Zealand, Netherlands, Switzerland, and the United States. Firearm categories include: Open Division, Metallic Sights, Service Pistol, and Revolver. In addition there be awards for the top shooters in specific classes: Law enforcement, Women, Junior, International, Newcomer, Senior, Grand Senior. This year, there are some new ways to save on entry fees. First, if you “bring a buddy” who has never competed at the Bianchi Cup, both you and your friend get a discount. Match organizers also offer reduced fees to Juniors, Production Firearms shooters, and Active Duty Military personnel. Share the post "Get Ready for the Bianchi Cup in May"
Cabelas.com and LaserLyte have teamed up to produce compact laser bore-sighters that fit inside your firearm’s chamber. The laser is housed in a brass assembly machined to duplicate an actual cartridge. 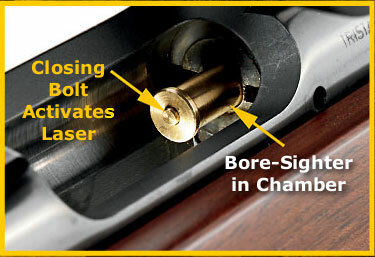 To activate the laser, simply place the bore-sighter in the rifle’s chamber and close the bolt. There are two core units, the Laserlyte Cabela’s Premium .223 (collimated lens $99.00) and the Pro .223 (standard lens $69.99). Both the Premium and Pro bore-sighters fit a .223 Rem, but they can be adapted to other chamberings by adding a caliber-specific sleeve over the .223 core unit. In addition, LaserLyte makes separate in-chamber bore-sighters for the 17HMR and 50 BMG. We are not big fans of laser bore-sighters, as we think they are unnecessary for most situations — at least with conventional bolt-action rifles. Visual bore-sighting is not difficult. Set up your gun securely on bags, remove your bolt and set up a 50-yard target with a large bright orange or black center circle. Look through the back of the action and you should be able to sight down the bore with your own eyes just fine. In fact it may be easier to bore-sight the “old-fashioned way” rather that try to see a laser in bright sunlight at 50 or 100 yards. There are instances when having a laser bore-sighter can save time, such as when setting up a chronograph. Also, with many semiautos and lever guns, it is difficult to sight down the bore because of the action design. Without using mirrors, it’s hard to visually bore-sight an M1 Garand, for example. Likewise, it can be difficult to bore-sight an AR15, because the stock and buffer is in line with the bore. For these rifle types, a laser bore-sighter is a valuable tool. We like the new LaserLyte design because it fits in the chamber, rather than in the bore. In-Chamber laser bore-sighters are also made by Aimshot, Firefield, and SightMark, in a variety of sizes. With muzzle-entry laser bore-sighters, you could have a nasty accident if you forget to remove the device. There is always the chance you could chamber and fire a round with the muzzle-entry bore-sighter still in place. Instant Kaboom. That has happened more than once. The new LaserLyte/Cabela’s bore-sighter fills your chamber, so there is no possibility you could chamber a loaded round with the bore-sighter in place. That’s an important safety advantage. The LaserLyte K-50 in-chamber bore-sighter is shown in the video below. Share the post "New Cabela’s In-Chamber Laser Bore-Sighter from LaserLyte"